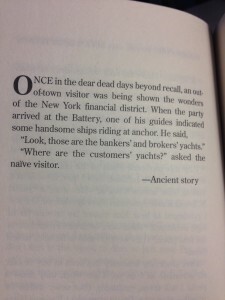 On the bottom of page 6 of the 2014 Berkshire Hathaway Annual Report, Warren Buffett calls Where Are The Customers’ Yachts?, a “wonderful book.” And in this book review, I’ll tell you why. 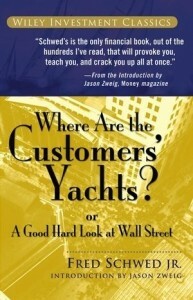 Where Are The Customers’ Yachts? is a skeptical look at the investment industry, and the implications for the everyday individual. It raises critical questions and identifies myriad causes for concern. The book covers everything from financial forecasting, to mutual funds, to short selling and much much more. The author highlights all-too-common missteps and expensive mistakes that are lurking just around the corner. The best part of Where Are The Customers’ Yachts? is the humour! Seriously: this book is hilarious! Once I started reading it, I couldn’t put it down. Once I heard what the author had to say about fat cat investment bankers, I was dying to hear what he had to say about options, finance reform and retail investors. The hilarity of this book really adds to it’s value as a finance book. The truth is, because the content is so engaging and entertaining, it really helps you remember it. So I’m not just saying you should buy this book if you’re looking for a laugh – just that it’s another added bonus and probably another reason this book has been so popular for so long. At this point, I usually find something critical to say about the book I’m reviewing. But in this case, there really isn’t much to criticize. The book isn’t a financial analysis text book, that’s for sure. On the other hand, it’s a memorable and concise account of what you need to be aware of when you’re thinking about what to do with your savings. Where Are The Customers’ Yachts? is an amazing book that has been published again and again as the years go by. Although the cover might get updated, and a new introduction or preface is added, the original timeless wisdom remains the same. And you don’t want to miss it. 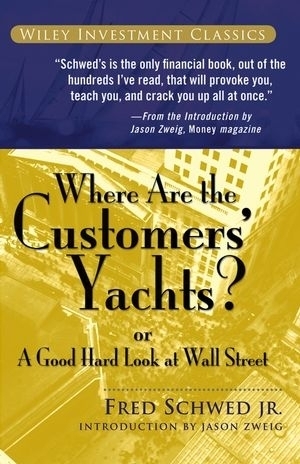 For those reasons, I definitely recommend you buy Where Are the Customers’ Yachts? on Amazon. But no pressure. If you’re still a little unconvinced, check out the video book review below for even more information. Sound good? This entry was posted in Stock Ideas and tagged investment book reviews on April 18, 2015 by Jworthy.